More info:Prices based on 2 adults sharing. From $1390 - $1560 per child inc UK flights. Mimimum age 7. Throughout Vietnam, Cambodia and Thailand we try wherever possible to use small locally-owned hotels that reflect the character. We work in partnership with our local in country ground agents to introduce environmental policies which help to conserve water usage and energy expenditure. 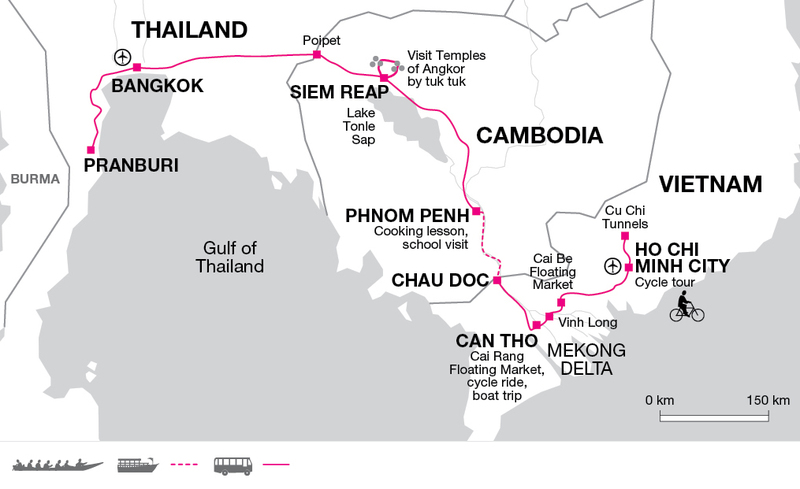 We cut down carbon emissions on this trip by using low carbon methods of travel such as cycling and boat rides where possible, examples of this are in the Mekong Delta, Ho Chi Minh city itself and the boat journey from Chau Dov in Vietnam to Phnom Penh, the capital of Cambodia. Waste - during the initial tour briefing all our guests are encouraged to use reusable water bottles to cut down on plastic use. On this trip we spend two days on the Mekong Delta taking a boat cruise to visit Mrs Nani’s home where we learn the ancient art of making rice paper; we also sample Vietnamese Banh Tieu which most closely resembles a doughnut. By supporting small family businesses we not only generate money for the local community we also provide a fascinating insight in the way of life of communities living in the Mekong Delta. There is time to visit the Cai Be Floating Markets where families can purchase locally produced goods and see how coconut candy pop-rice, pop-corn and rice wine is made. Whilst in Phonom Penh (day six) we spend the morning preparing a traditional Khmer meal, at the start of the day we head down to the local market to barter and purchase fresh ingredients to use later that morning, once again supporting local business. We have a long partnership with our local partners, employing Vietnamese tour leaders and using local guides at the major attractions along the way. Entrance fees at Angkor Wat and in Phnom Pehn help go towards preservations of these famous historical sites for future generations.